It’s not long now to payday. Wait it out with this lot over the next few days. 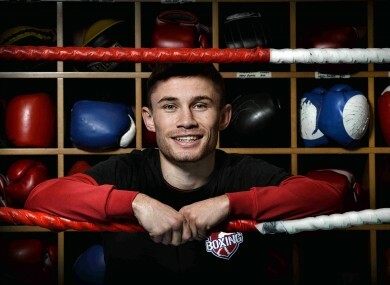 Carl Frampton ahead of his Commonwealth and IBF Intercontinental title defence against Steve Molitor. One to watch: I think there’s a Gaelic football match on Sunday afternoon, right? One to Sky+: United v Liverpool and Man City/Arsenal? Get on it. One to skip: I’m not one for F1 practice sessions of a weekend morning. Cricket: Twenty20 World Cup, Bangladesh v New Zealand, (Sky Sports 1, 10.30am); Afghanistan v England, (Sky Sports 1, 2.30pm). Dart: European Championship (ESPN, 7pm). F1: Formula One, Singapore Grand Prix, first practice session, (Setanta Ireland, 10.55am); second practice, (Setanta Ireland, 2.25pm). Football: Airtricity League, Bray Wanderers v Sligo Rovers, RTE 2, 7.05pm; Championship, Blackburn v Middlesbrough, (Sky Sports 1, 7.30pm). Golf: The Tour Championship (Sky Sports 2, 6pm). Snooker: Shanghai Masters, (Eurosport 7.30am-10.30am; 12.30pm-1.30pm). Boxing: Commonwealth and IBF Intercontinental Super Bantamweight titles, Carl Frampton v Steve Molitor, (Sky Sports 1, 9pm). Cricket: Twenty20 World Cup, Sri Lanka v South Africa, (Sky Sports 1, 10.30am); Australia v West Indies, (Sky Sports 1, 2.30pm). Darts: European Championship, (ESPN, 1pm). Equestrian: Global Champions Tour, (Eurosport, 8pm). F1: Singapore Grand Prix final practice session, (Setanta Ireland, 9.55am); Singapore Grand Prix qualifying, (BBC1, 1pm; Setanta Ireland 12.55pm). Football: EA Sports Cup final, Shamrock Rovers v Drogheda, Setanta, 5.30pm; Premier Soccer Saturday, (RTÉ Two, 8.30pm). Premier League, Swansea v Everton, (Sky Sports 2, 12.30pm); Championship, Birmingham v Barnsley, (Sky Sports 2, 5.15pm); Serie A, Juventus v Chievo, (ESPN, 7.45pm); Primera Division, Barcelona v Granada, (Sky Sports 4, 8.55pm). Golf: The Tour Championship, (Sky Sports 3, 5pm). Snooker: Shanghai Masters, (Eurosport, 7.30am). Rugby: RaboDirect Pro12, Leinster v Edinburgh, (RTÉ Two, 6pm). ITM Cup, Auckland v Wellington, (Sly Sports 1, 6.30am); ITM Cup, Northland v Taranaki, (Sky Sports 1, 8.30am); Currie Cup Western Province Griquas, (Sky Sports 4, 1.55pm); Premiership, Gloucester v Wasps, (Sky Sports 2, 3pm); Currie Cup, Blues Bulls v Free State Cheetahs, (Sky Sports 4, 4pm); Premiership Leicester v Harlequins, (ESPN, 5pm). Cricket: Twenty20 World Cup, Pakistan v New Zealand, (Sky Sports 2 1030; England v India, (Sky Sports 2, 2.30pm). Cycling: World Road Cycling Championships, (Eurosport, 9.15am). F1: Singapore Grand Prix, (BBC1, 12.10pm, Setanta Ireland, 12.55pm). Football: Premier Soccer Saturday, (RTÉ Two, 8pm). Premier League, Liverpool v Manchester United, (Sky Sports 1, 1pm); Manchester City v Arsenal, (Sky Sports 1, 3.30pm); Primera Division, Athletic Bilbao v Malaga, (Sky Sports 1, 6.45pm). Primera Division, Rayo Vallecano v Real Madrid, (Sky Sports 1, 8.30pm). GAA: All-Ireland SFC final, Mayo v Donegal, (RTÉ Two, 2.15pm); All-Ireland MFC final, Dublin v Meath, (TV3, 1.15pm); The Sunday Game, (RTÉ Two, 9.30pm). Golf: The Tour Championship, (Sky Sports 3, 4.30pm). Email “Don't touch that dial... here's the sport on TV this weekend”. Feedback on “Don't touch that dial... here's the sport on TV this weekend”.